monday morning knits: Spend Your Money Where It Counts...on Yarn! My husband and I are frugal. Not cheap...frugal. We live on a budget and we don't l ike to spend our money on things just to have more things. We like to spend our money on items that we believe will improve our life. We don't have cable because we find that when we watch tv we become zombies and forget to talk to each other. He doesn't golf because 4 hours on a Saturday afternoon could be spent doing something better - like enjoying the delights that are our two children. I don't leisure shop because really, I don't need another purse or another pair of shoes. Food. Diapers and wipes. Books. Coffee. Dinner together. Zoo trips with the kids. Family trips. Mountain biking (hubby). Yarn (me). Since the last item is by far the most important of all (besides the kids, of course), I'll focus on ways to make your money count when it comes to yarn. Some of these ideas are mine, some are great tips from others but one thing is for sure: they're all great ideas for saving money on what's not necessary so we can buy more of what we love...yarn! Lesson #1: You don't need every knitting gadget known to man. When I first began to knit, I wanted it all. Fancy stitch markers, beautiful stitch holders, needles in all shapes and sizes with funky bobbles on the ends, handles for all the purses I'm sure I'll knit someday, the latest knitting bags and pouches plus all the yarn a girl could handle (which I've come to discover is an amount that I'll never achieve because I could have all the yarn in the world and it still wouldn't be enough!). However, as I wound ball after ball after ball of yarn, the thing I began to covet was a swift and a ball winder. As of today, I have yet to buy one. Why? Because the $70 I would spend on a ball winder and swift could be much better spent on beautiful, luxurious yarn. When one knits, you need three things: yarn, needles and hands. That's it. Granted, I still would love to have a swift and ball winder someday, but, until my knitting budget grows substantially larger or someone gives them to me for Christmas, I've found a great alternative in the mean time. Dumbells. I have these two pink 5 lb - dumbells lying around the house that I like to tell my husband I use to "exercise." I do use them, just not for their intended purpose. Instead, I place my untwisted skein of yarn around them and use them to keep my yarn from slidi ng everywhere as I ball it. 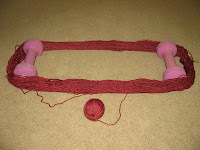 Balling yarn has become less tiresome because I find I'm not fighting with my yarn, I'm not holding it with my toes until they go numb, and, if my husband walks in, I can quickly change gears and act as if I've been toning my triceps for the last 15 minutes! Stay tuned for Lesson #2: Look in person, research online, buy where the price is right! Tips for getting the most bang (or yards!) for your buck! Here’s what I’ve been doing (got the idea from the internet). 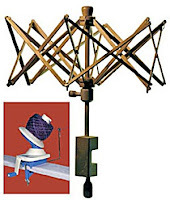 I have an old, beat-up lamp with an enormous shade. I drape the yarn over the shade, remove the finial (sp?) and let the shade spin while I wind the yarn. Great post! I enjoyed reading it. And thanks for the tip on the dumbbells. I do have a winder, but no swift. And I absolutely have a pair of weights that are currently not being used. Love that idea. I'm the same way about a swift/ball winder. I can't even begin to tell you how many times I've actually held a swift/ball winder combo in my hands, walk up to the checkout...turn around put it back and buy $70-$100 worth of yarn instead. Then I get home and realize I need to wind it all. Fortunately, the backs of my kitchen chairs are perfect for winding hanks!